Toad has always been that character apart of the Mario series that you know. You could never touch a Mario game in your life and yet still know who Toad is. He appears in every game, and has been symbolic within Mario's world since the beginning... So it was surpring to me that a global, casual game has never been done for him. Sadly, when it finally did come out on the Wii U a few years ago the sales were horrific due to the Wii U's failed sales. BUT fast forward to 2018, and Nintendo has decided to bring the game back to life on one of Nintendo's most successful and current consoles: the Nintendo Switch! Note that during this review, keep in mind that I have NEVER touched Captain Toad for Wii U. At the time, I just didn't find it appealing. I've never been the puzzle game type of gamer... but after seeing it on the go watching my girlfriend play it, it really stood out to me. On sale, I picked it up and decided to give it a 100% run to really get the full experience. Was it worth it? or do I wish I never bought it? The story is simplified and like any other Mario game. Captain Toad and his sidekick Todette are on a treasure hunt collecting treasure around the Mushroom Kingdom! It isn't until they mistakenly end up in an area that wasn't exactly theirs that a upset foe scares Toad away while kidnapping Todette! So not only does Toad have to continue his search, but to also rescue his friend! I'm going to be honest, this is what made me purchase the game. The game is absolutely gorgeous, taking graphics from Wii U's Super Mario 3D World and using the physics to create these cube-like, colorful, and rich stylized look that you can only be curious about. Watching my girlfriend, I saw the way the camera rotated, how every piece of the level: up, down, left side, right side was so detailed while having it's own secrets and own colors that brought magic. Everything is clear to see, while at the same time doing such a great job at hiding treasure, and secret areas. One thing I'm not a fan of is the music... but at the same time it suits Toad VERY much.As a kid hearing Toad, me and my cousin would always try to imitate his loud, scratchy, and unsettling voice. It became a meme across the community, and hearing him you know who it is. He doesn't say much, thankfully but the music does. The music has a nice "toad" and "treasure" vibe added to it, and the rhythm tells you that you're on a hunt, and an adventure, and that you're not ready to give up! Of course, being a side game from the Mario series, not much music tracks were produced. The main theme is played quite a lot where after the 200th time you'll get the music stuck in your head. The tracks on each level are re used as well, taking music from Super Mario 3D World and other games. So even though I may not have been a fan of the new / Toad exclusive music, I do think each piece really suited each level just fine including the main theme for the treasure tracker himself. The main goal of each level is to get from point A to point B which is the Star (from Mario Bros.) which is also the main treasure in this game that Toad is collecting. This sounds easy, but once you look at your surroundings you'll notice it's not. You're spawned in a cube-like world that can sometimes have a whole different kind of level just on the other side of a face. One moment you're seeing just the top where Toad is, full of greenergy and pipes. Then when you rotate the camera, there's an underwater area waiting for you to explore. There are also secrets all around the level, puzzles and treasure gems (3 in each level) to find before headed to the star. A simple "walk up the stairs in front of you " can take a 5 second level to a good 5-10 minutes. The controls are very simple luckily to control. Walk with the anolog, pluck items from the ground using X or Y and rotate the camera using the other anolog. You can run too with the triggers, but that's it. Very simple controls that anyone can pick up, and can understand the game with. There are 3 chapters in the game, the first being about Toad saving Todette while chapter 2 is about Todette saving Toad! Playing as Todette is really cool, I always prefered her and the character swap (even though they play the exact same way) to make the game feel fresh. While the 3rd chapter you use Toad and Todette to take down the final enemy and collect the ultimate treasure! Each level is also extremely clever on design, traps, and ideas. Some levels will be basic puzzle solving, while others are very gimicky for example: riding blocks after blocks or moving at high speeds across a bridge before it breaks down. The most challenging of challenges are when Toad eats a Cherry, which adds a second Toad to the game, you can get up to 4 per level if the Cherry is presently there and you must guide all of them at the same time. There is also plenty of content, which I didn't expect. In the switch version, there is an extra chapter as well exclusively for the Switch that takes inspirations from other Mario Games such as Odyssey, and more! But this is where the annoying, repetitive part comes in, for you to 100% complete the level you must collect the 3 hidden gems, the star, as well as find the Toad sticker hiding around the world, and beat the hidden extra challenge in the level. 2 of these are only available to do after you complete the main level. You'll unlock the mode to find the Toad sticker, and the hidden challenge will be unlocked. I HATED this and made me finish this game extremely slowly. I would have to take days of breaks and sometimes get myself to get back into it because as exciting, and captivating and fun the levels are... they're only fun once and I don't wanna keep playing the level potentially 4 times. Good thing the levels are small, I even started using a guide on Polygon to complete each level on my first try so I wouldn't have to play it again which many times, I HAD to actually do the level more than once due to treasure that can be sometimes only caught through 2 playthroughs. This was my worst time with the game... and got me to the point of feeling over-exhausted and just wanted it to end. 6) Complete the BONUS final level after completing ALL above ^. With that, your file will turn gold and will let you know that you are finished the game. As stressful as that FINAL level was (view my twitter for more info) I was super happy that I was rewarded for every task that I accomplished. I have never enjoyed Puzzle games, but you know what, Captain Toad was alright. I feel it's a game that everyone can pickup and play on the go when they have a few minutes. Levels are short, and challenging yet easy all at the same time. Though, the extra challenges in each level and the Mario sticker was VERY repetitive at times, so if a future title appears I recommend this to all be included in the level from the gecko OR to have a seperate challenge mode or "find Toad" mode. It would have been way more refreshing, and would offer a lot of diversity to any player who wants to pick up the game. 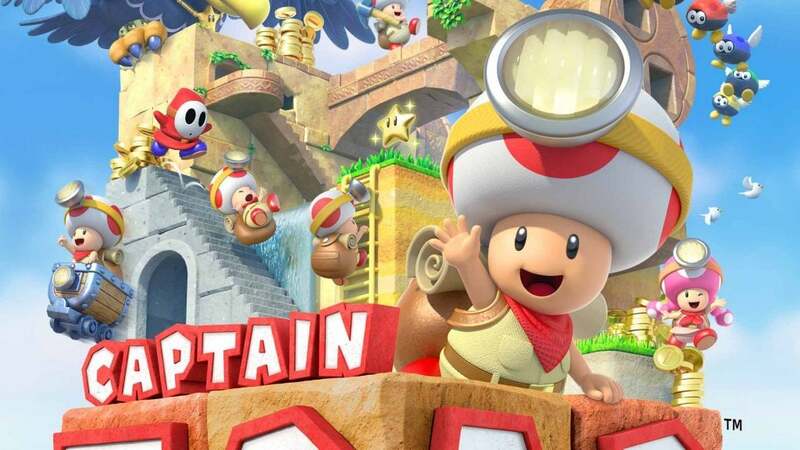 If you're someone who's always on the go, who likes puzzles, and who wants to stay busy for quite some time with 1 title: Captain Toad is for you. But if you're like me who can't handle repetition well, and needs a lot of breaks from puzzle games but wants to give this a go? Maybe wait til it's on sale. It's for sure a game though, that needs to be played.